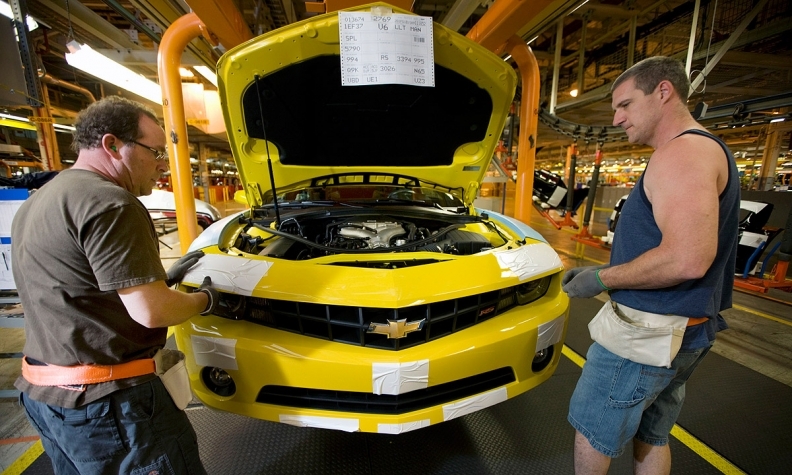 GM is moving output of the next-generation Chevrolet Camaro from an Oshawa, Ontario, plant to a factory in Lansing, Mich.
TORONTO (Reuters) -- The union that represents General Motors' Canadian workers may seek early negotiations to secure jobs at the company's Oshawa, Ontario, operations, Unifor National President Jerry Dias said on Friday. Unifor's current contract expires in the fall of 2016 and part of GM's Oshawa operations, the consolidated line, is set to close sometime that year. GM has already delayed its shutdown several times, most recently in 2013. Dias compared the situation to 2006, when Unifor's predecessor -- the Canadian Auto Workers -- agreed to a special "shelf" agreement with GM to secure new investment in the middle of a contract. "We could easily do that again if instead there is a solution for consolidated and flex," said Dias, referring to the two assembly lines in Oshawa. "I would never walk away from a commitment to product." Shelf agreements typically include special concessions from workers that do not go into effect until the employer makes some promised investment to protect jobs. GM has already announced plans to move production of the next-generation Chevrolet Camaro from the Oshawa plant to a factory in Lansing, Mich.
GM Canada has said in the past that it will not be able to make a final decision on the consolidated line until 2016. But asked about the possibility of early talks, GM Canada President Stephen Carlisle did not rule them out. "Who's to say what's possible at this stage?" he told Reuters on Thursday. "It's been done before - so let's see. I wouldn't rule it out." The union would need to know what vehicle GM is considering for the site, something it has yet to reveal, said Dias, who had what he called a "very good" meeting with GM CEO Mary Barra earlier this week. "It doesn't make any sense to go into bargaining if we don't know what the finish line is," he said. "We need to understand what it is we're chasing." Carlisle said any discussion about the future of the consolidated line needs to start with the basics. "We could take any old generic product and say, 'what does the business case for that product look like in Oshawa versus some other place?'" he said, noting that labor costs are just one of several factors.